Father Donald Francis Grasha is the son of Frank and Margie Grasha, and was born in Cleveland, Ohio. The family relocated to North Hollywood, California in 1963, and Donald attended St. Patrick’s Grammar School. 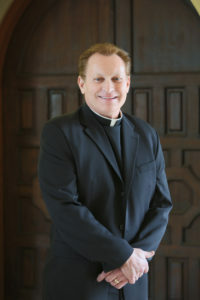 He graduated from Pater Noster High School in 1975 and went on to attend St. John Seminary College in Camarillo, CA to begin his preparation for the priesthood. Donald has served as an assistant pastor in several parishes in the Los Angeles Archdiocese including: Our Lady of Perpetual Help in Downey, Our Lady of Lourdes in Tujunga, Santa Teresita in Duarte, Sacred Heart Church in Ventura, and St. Margaret Mary Alacoque in Lomita. He was the Pastor of St. Luke’s Church in Temple City for 10 years. His 25 years of pastoral ministry included meeting with couples for marriage preparation. He enjoys meeting couples and the energy and enthusiasm that they bring to each other. Father Donald has also been Pastoral Care Director of Santa Teresita Hospital in Duarte and has worked with inmates as a chaplain at the North County Correctional Facility in Valencia. Father Donald has many hobbies. He has participated and completed eight marathons, is an avid sports fan and bleeds Dodger blue! He is a certified addiction counselor and finds it rewarding assisting people in their journey through recovery as they embrace hope for the future and connect with their loved ones in sobriety. Like his father, Donald plays in a Croatian band playing ethnic folk music with a local group in the Los Angeles area. Donald and his wife, Rosie reside in Northridge, CA.